Pesticide Safety Education Programs were establishe d nationwide in each Land Grant university, and funded to support certification and training efforts of the United States Environmental Protection Program (USEPA) as mandated in 1974 under the Federal Insecticide and Rodenticide Act [FIFRA [Section 23(c)] . The 50th anniversary of PSEP in the United States was September 2014. To protect human health and the environment from pesticide misuse, PSEPs partner with state & federal regulators to educate all appropriate audiences on the safe and legal handling of pesticides from purchase to use and/or disposal. Federal pesticide regulations require each state to provide certification and training for licensing of applicators using “restricted use pesticides”. PSEPs are best positioned for synergies with the network of PSEPs, and other land-grant University extension and research experts, to ensure that complicated concepts, controversial subjects, and inaccurate messages/ perceptions are addressed with science-based, non-biased information. New Jersey is a relatively small, yet densely populated state that is rich in environmental resources. Pesticides are used for the management of pests in a diversity of businesses including landscaping, farming, nurseries and greenhouses, and interior pest control. The mission of Rutgers Pesticide Safety Education Program is to serve the people of New Jersey through the acquisition, dissemination, and application of scientific knowledge in the area of pesticide safety education. We use our knowledge of pesticide safety to improve human health, quality of life, and sustainability of natural, managed, and agricultural ecosystems. 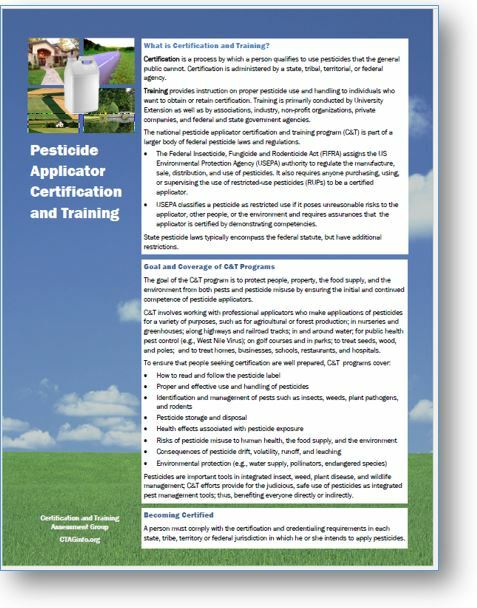 continuing educational opportunities for licensed pesticide applicators. New Jersey pesticide regulations are more stringent that Federal USEPA regulations. To protect human health and the environment in the Garden State, New Jersey regulations require that private/commercial pesticide applicators to be licensed to apply any EPA-registered pesticide. NJ PSEP is the designated Extension program within Rutgers University for New Jersey that serves as a liaison with the USEPA and the NJDEP, providing a focal point of New Jersey pest management and pesticide safety outreach. Serves a wide diversity of stakeholders, providing a logical trusted connection between pesticide regulators and the regulated community. Programming is tailored to our state’s diverse clientele of growers, green industry, and pest management professionals. The NJ PSEP program is a gateway to Rutgers NJAES research and extension programming; as well as university Extension PSEP programs and resources nationwide. Expert in federal and state regulatory requirements, target audiences, use sites, and educational techniques which are diverse and constantly changing. Educates directly and indirectly, by producing training resources for, providing training to, and/or assisting with training by county agents, associations, state regulatory agencies, university specialists, registrants, Master Gardeners, health professionals, non-English trainers, and schools. Provides objective, science-based support to state and federal regulators who must increasingly assess proposed pesticide safety-related laws, and amendments and sunset provisions to existing laws. Provides outreach for individuals to meet certification/recertification requirements for licensing under NJAC 7:30. Provides opportunities for resource development for applicators seeking certification in minor categories of pesticide use, and for other under-served audiences. NJ PSEP provides outreach for those seeking to become licensed per NJAC 7:30. Coordinates outreach with NJDEP to keep applicators current on regulatory requirements and compliance issues in New Jersey including initiatives on pollinator protection and Worker Protection. Collaborates with EPA and NJDEP to determine core competencies to be covered in training manuals for Private Applicators, Commercial Applicators, and Pesticide Dealers. Develops new/ revises existing content of pesticide applicator training manuals in 24 subcategories of licensing. Publishes and distributes manuals to clientele via County Cooperative Extension offices (~2,000 manuals distributed in 2014). Provides training through manual study to take certification exams (~ 175 Private, and ~ 2,000 Commercial Pesticide Applicators certified in 2014). Provides basic CORE training courses required for commercial applicator and operator certification (~9 courses annually; 5 are bi-lingual). Provides outreach to licensed Private Applicators (~ 1,800 agricultural, nursery, & greenhouse growers; and their employees licensed in 2014). Provides outreach to licensed Commercial Applicators (~ 8,500 licensed in 2014). Applicators for-hire in urban settings includes turf, ornamental, institutional, residential, & structural pest management; and School IPM. Partners with Rutgers Cooperative Extension colleagues to deliver CORE recertification training at annual stakeholder conferences and meetings throughout New Jersey) 1 NJ PSEP trained ~ 2,000 applicators in 2014; more than 3,500 CORE recertification credits awarded. Delivers targeted outreach via publications; websites; and listserv postings for County Agents, trade associations, and applicators. Provides technical content and design of three Rutgers Pest Management Office websites for pesticide applicator training; Worker Protection; and School IPM. Offers two online CORE recertification courses. PSEPs have a significant educational impact on non-regulated applicators and on ~1MM pesticide users in the general public. NJ PSEP trained ~200 Master Gardeners for 16 County Extension volunteer certification programs in 2014.